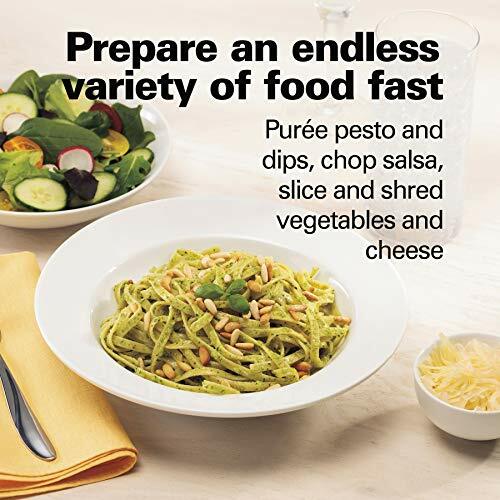 Food processors are an essential kitchen tool if you make a lot of purees for yourself or your loved ones. 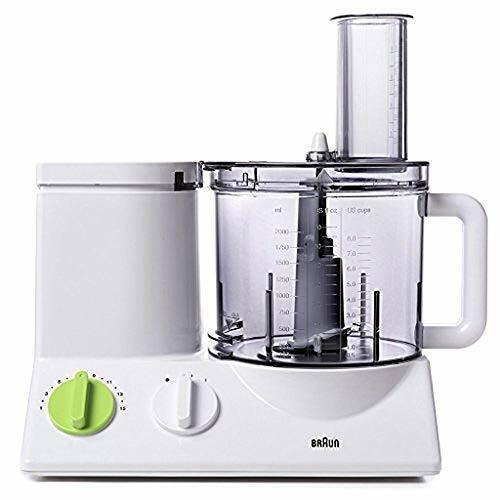 They can easily chop, slice, mix, mash, and puree solid foods into a perfectly smooth consistency in seconds, making you delicious smoothies, mashed vegetables, soups, sauces, gravies, and more. But, they can run pretty high in terms of price, depending on the quality you want. The good news is that there are a few high quality food processors you can find online for under $200, and I have them listed out for you below along with my personal take on each of them. Check them out and see which one would work best in your kitchen, and for your lifestyle. Some are simple, straightforward machines that get the job done. Others are a little more high-tech, and pretty versatile in terms of features. 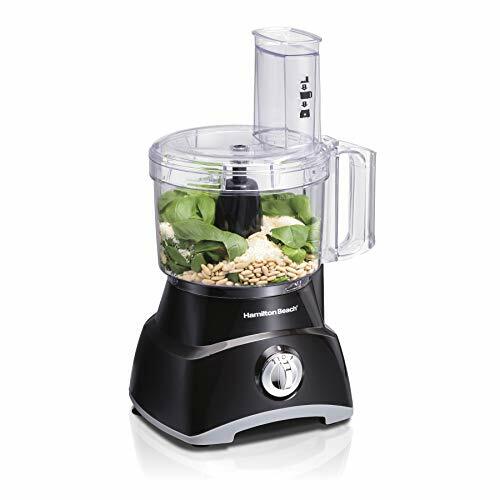 First up, the Hamilton Beach 8 cup food processor is a fairly standard machine, with a 450 watt motor and 2 speeds plus a pulse function. You won’t want to go less than a 450 watt motor if you’ll be using your food processor mostly for pureeing, because any less power won’t be enough to get that smooth consistency you need. Other than that, its 8 cup capacity should meet most people’s needs, as that’s a standard serving size, or a great size for a side dish, for example. It has a high quality stainless steel reversible S shaped blade that can chop, mix, shred, slice, and puree all in one. The bowl, lid, and blade are also dishwasher safe for easy cleanup, and best of all, all parts of this machine can be stored inside the bowl for a compact storage option. 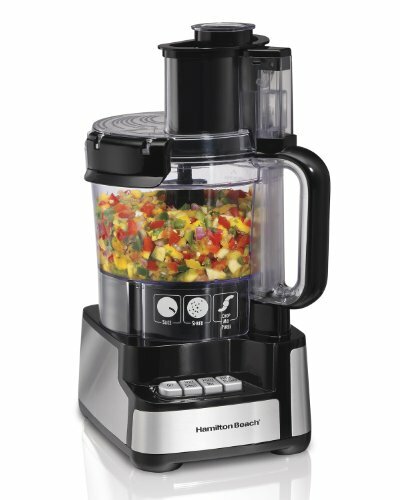 If you want to stick with Hamilton Beach but you need a little more room to work, check out the 12 cup capacity food processor. The bowl is also a step up from the previous food processor because it has a pour spout and a seal to prevent leaks and spills. It still has that powerful 450 watt motor, 2 speed/pulse function, and efficient, multifunction S blade though. The other advantage of this food processor is its extra large feeding chute. This part of the machine is large enough to fit an entire large vegetable, so it gets rid of the need to pre-chop the ingredients. It’s also very simple to use with its stack and snap assembly design, so you don’t have to struggle with any twist and lock function. The processor comes with a guide as well, which shows you which blades to use for certain dishes, along with the best settings and buttons to use. 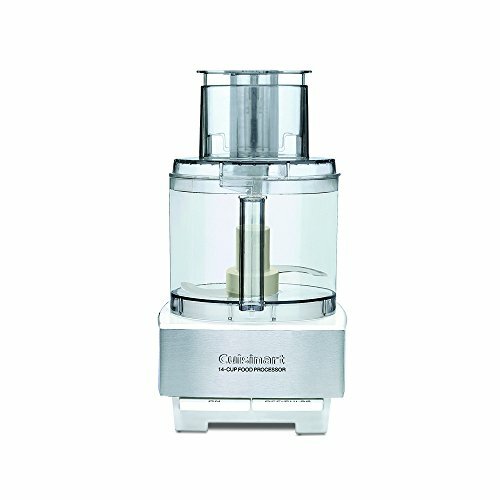 Next up, check out Cuisinart’s 14 cup food processor if you can spend a little more and use food processors very often for large meals. The capacity is the largest on the list, so if you do a lot of food preparation, or have a big family to cook for, this is a great option. It has an extra large feeding tube for these big cooking tasks as well, saving you time and effort. Instead of a singular S shaped blade, this food processor comes with a specialized slicing disc, shredding disc, and a chopping blade, all made out of stainless steel, along with a spatula and recipe booklet. It also has a more powerful motor, 720 watts to be exact, and all pieces except for the base are dishwasher safe. 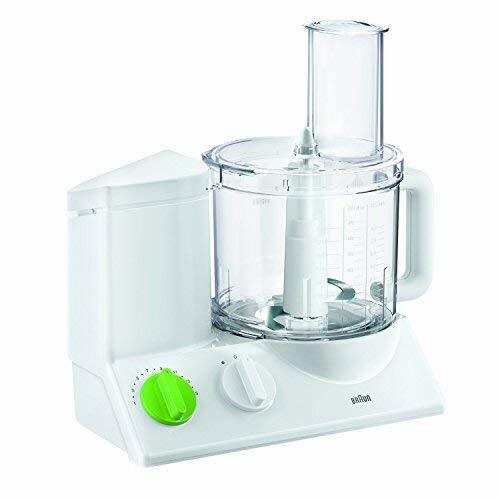 If you want some extra features with your food processor, check out Braun’s 12 cup machine, which has a juicer attachment along with the primary food processing function. It also has 7 attachment blades and a chopping bowl as well. If versatility is a must for you, this is a great option. 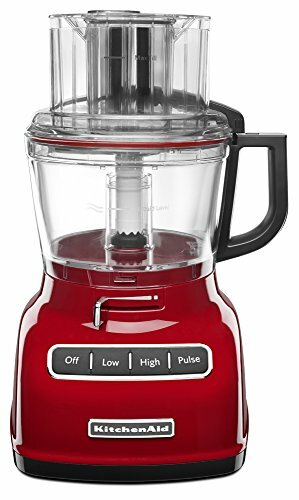 You can chop, slice, whisk, knead, juice, and puree with this machine with personalized speed settings along with a pulse mode. It also has a powerful 600 watt motor, a happy medium between the processors mentioned above, which is very quiet to boot. The whole machine is also relatively compact, so it won’t take up too much space in your kitchen. 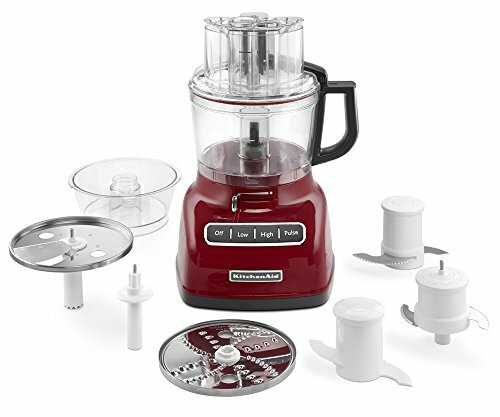 Finally, KitchenAid makes a nice food processor that gives you a lot of control over your dish. It has an “ExactSlice” system that’s adjustable from the outside of the machine that lets you control the speed of the blade on high, low, or pulse settings, along with a lever that allows you to adjust from a thick to thin consistency. You won’t find this kind of control elsewhere. This machine also comes with the 9 cup work bowl, a 3 cup bowl, an adjustable slicing disc, a reversible shredding disc, a multipurpose blade, and a dough blade for any and all cooking needs. The bowl has a tight seal feature to prevent leaks as well, and it comes in 4 colors (red, silver, black, or white). The only drawback to this pick is that all of the parts are recommended hand-wash only. As you can see, food processors are versatile, useful tools to have in any kitchen, but especially if you do a lot of pureeing. Think about your unique lifestyle and pureeing needs before choosing one of the food processors above. For example, if you only cook for yourself, you may not need a 14 cup capacity work bowl. On the other hand, if you do a lot of food prep for yourself, a large container might be useful so that you can store the leftovers for future meals. Again, it’s completely up to your discretion, but the processors outlined above are the best on the market at this price point. My personal favorite is the KitchenAid , with the consistency control feature. If these prices are a little more than you want to spend, check out these great food processors that are under $100.00. There are even a few that you can get for less than $50 that I also recommend. What’s your favorite food processor for pureeing? Please share your thoughts in the comments below, and share with your friends and family on your social channels!